The sturdy construction paired with easy operation. The enormous power combined with long operation time. 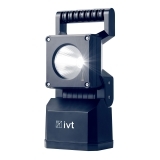 Additionally, IVT offers energy-efficient 12 V and 24 V LED lighting for indoor and outdoor use. Whether stationary or mobile – IVT lamps are versatile in their application as work lamps, path or orientation lamps, warning lamps or emergency lighting in the case of power outage. Overcharging and deep discharge protection with electronic charging switch, ATEX protection, dust and watertight housing – with these and other safety features you can always rely on your IVT lamps. Different brightness levels, divers light sources, swiveling lamps head – IVT work lamps and portable lamps allow for precise illumination of the desired area. Long-life components, impact-proof glass, massive housing – IVT lamps are so robust and well-crafted that we provide a 3 year manufacturer warranty on all products.